Pride day was sooooo much fun. 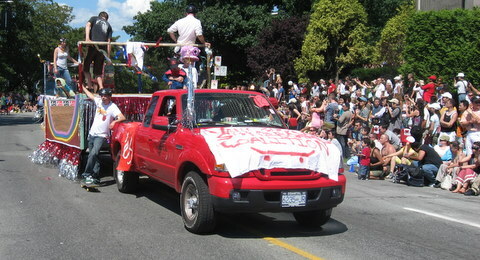 Our float rocked, litteraly back and forth but the shredders still ripped it up. There was almost 400,000 peeps in attendance. I am tired so I won’t write much here. Now we are just getting ready for the Christmas parade. Wuhoooo. Dtwn Jay will be on City Tv chanel 13 tomorrow morning between 9-930am check him out. It will be a 3 minute segment about our float, malady the pride parade and other fun stuff. Aparently Dermer will be with him doing some shred stuff. I will try and post a clip. 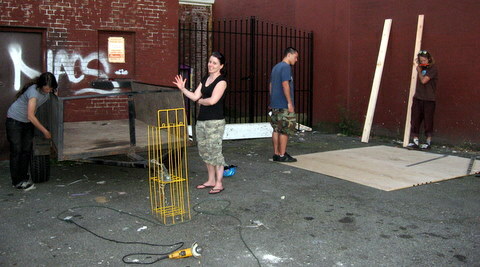 Ramp construction of our Parade Float is well under-way. We will be ready this Saturday evening for float decoration. We will supply decorations and you can supply your creative ideas. We are meeting at antisocial in the back alley at 7pm. So come on dowwwwwwn. A big thanks to ES, Alan Degenova, Antisocial, Seb, Mavi and all the volunteers that are working hard to make this event possible.